Larry Dale Hite, age 58, passed away on November 28, 2018. He was born on September 26, 1960 in Tulsa, OK to Eugene & Wanda Hopkins Hite. Larry grew up in Sapulpa & graduated from Kellyville High School. At the age of 17, Larry joined the U.S. Navy, serving in peace time aboard a submarine and stationed in Hawaii. He married Pat Bearden on May 10, 2002 in Chandler, OK. Larry started his career in the copier business in Tulsa Okla. when he got out of the Navy, He was the General Manger of Central Business Equipment in Okla. City until 2005, Changed careers in 2005 and worked with Pro Install until 2011, then started his carreer in the oil and gas industry in 2011 until present, most recently as a thru tubing specialist with TTS of McAlester OK. He was a workaholic. 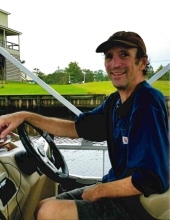 He enjoyed fishing, golf, woodworking and traveling .He loved spending time with family and enjoyed music. Larry is preceded in death by his father Eugene K. Hite , paternal grandparents Elmer and Emma Hite, maternal grandparents Clinton and Lizzie Hopkins , and son Lee Honeycutt. He is survived by his wife Pat, mother Wanda Howard, son Dustin Hite of Oklahoma City Oklahoma, daughter Tracey Shepherd and partner Josh Lippee of Oklahoma City Oklahoma, daughter Misty Boomgaarden of Oklahoma City son David Doe and daughter in law Christy Doe Of Marietta Oklahoma, Sisters, Regina Dearman of Tulsa Okla. and Leslie Bunch and husband Jimmy of Ardmore Okla. 9 grandchildren 2 nieces and 2 nephews, numerous friends that became family. In lieu of flowers, Larry’s family has asked that contributions be made to the American Cancer Society. Funeral services will be Tuesday, December 4, 2018 at 2pm under the direction of McNeil’s Funeral Service, Mustang, OK.
To send flowers or a remembrance gift to the family of Larry Dale Hite, please visit our Tribute Store. "Email Address" would like to share the life celebration of Larry Dale Hite. Click on the "link" to go to share a favorite memory or leave a condolence message for the family.